It is the hottest July ever recorded here in Hamburg! I feel like I’m melting every time I step outside! 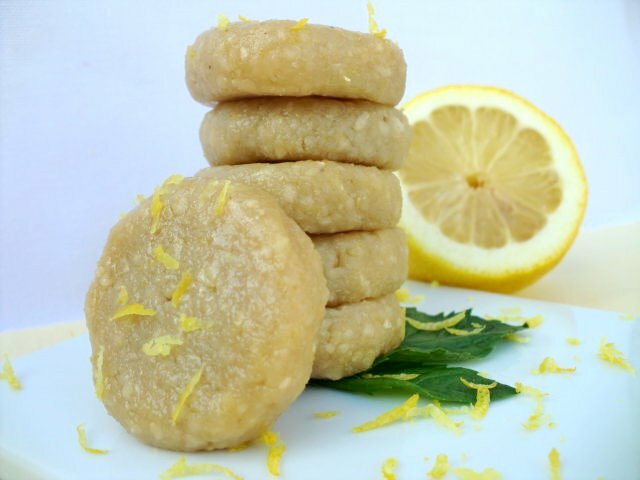 And besides cold showers, one of the many ways I’m cooling off is enjoying these Southern inspired Lemon Icebox Cookies. These summer cookies have a delicate tangy and sweet flavor that melt in your mouth. This recipe makes a double batch and I keep half in the freezer at home and the other half at work. So anytime I feel like enjoying a cool treat or feel like the heat is melting me, I grab one of these from the freezer and enjoy it with Watermelon Juice or Sweet Tea! Grind the cashews in a food processor until a powdery meal forms. Add the rest of the ingredients and continue processing on low until the dough forms a large ball. Measure out 1 1/2 tbls size cookies out and roll and flatten into cookies shapes. These can be as thick as you want, 1/4 to 1/2 inch thick. Place in a plastic bag in the freezer. These will keep for up to 3 months. This entry was posted on July 20, 2010 by Olive. It was filed under Uncategorized . I hear ya on the heat! Ack! But these cookies look so refreshing, I love lemon in desserts! YUM! Love luscious lemon…oh so pretty! It’s hot here in Ohio too! Ugh! Enjoy! thanks for this recipe. sounds amazing and i absolutely love lemon!!! definitely making these soon…like tomorrow!!! OH MY GOSH, my mouth is watering so bad from this photo. Tomorrow I’m going to the grocery store to get all ingredients. I wish I had a 24 hour store near by. These look good! I’m going to give them a try. These are delicious!!! I made some this weekend and brought some over to Mary for a girly chat and cookie date 🙂 they are sooooooo goood, my favorite part, just like when i was a kid, was licking the mixing bowl clean after making the cookies! MMmm mmm good! These look delicious! I am pretty new to raw but these look amazingly easy. One quick question..do you soak the almonds first? Thank you Carla. I totally meant to say cashews. Can’t wait to make these. I just made these, got it from your post on goneraw.com! I can honestly say, in all my adult life, I have never licked my fingers so quickly while un-baking! Great recipe and beautiful presentation in all your ideas!!! Mmmm, these look sooo good! Actually though, all of your food does! These are delicious! Perfect lemon flavor. do you think a combo of brown rice syrup and a little stevia would substitue alright for agave? Hi Debbie, I have yet to start experimenting with brown rice syrup. I’m sure any sweetener would work as long as it is sticky since it is also the binding agent in this recipe. Have you ever dehydrated them? I wonder how that would turn out. I am going to make these tonight. I will post my results. And I think some of the dough I will roll really thin (1/4 inch) btwn parchment and cut thinner cookies and attempt dehydrating for a couple hours and then glazing them!!! 🙂 This will be my first recipe prepared from your site. All of your recipes are sooo very inspiring to me as I begin incorporating more raw foods into my diet.